The NWLSSP works with a wide range of partners from local, regional and national backgrounds. A number of those partners with an explanation of how we work together are below, for further information about each organisation click on the logo to be taken to their website. The North West Leicestershire Sport & Physical Activity Alliance is made up of many different partners including the NWLSSP, the District Council, National Governing Bodies, Voluntary Action Leicester and Leicestershire Partnership NHS Trust. The aim is to assist and increase the provision and participation in sport and physical activity at all levels in North West Leicestershire. Principle Financial Services are committed to providing the highest level of service at all times. Based in North West Leicestershire and covering the East Midlands, Principle Financial Services are a ‘whole of market’, privately owned independent financial consultancy. Shane Fox, Company Director said: “ For many years I have been involved locally as a Volunteer Coach and Mentor to numbers of children throughout local schools and Rugby Clubs alike. I have always had a close relationship with NWLSSP and it is an honour to further support their fantastic work with all things sport, giving our local children opportunities to participate and compete in a whole range of activities. Principle Financial Services offer all clients a free initial consultation and review of your financial circumstances so as to fully understand your requirements. This appointment can be arranged in the comfort of your home at a time to suit you and will ensure that your financial arrangements are up to date, safeguarding your future. Principle Financial Services will donate a fixed fee for every client instruction received through their offices and clients are asked to quote code: SSP10. Principle Wills are committed to protecting what matters most… Offering peace of mind from knowing that your family will be secure for tomorrow by offering a personal service tailored to your individual needs throughout the East Midlands from their base here in North West Leicestershire. Involved locally as a dedicated Volunteer Coach and involved in all things sport and leadership, Managing Director, Shane Fox said; “I have always had a close relationship with NWLSSP and it is an honour to be able to further support their work providing our local children with fantastic opportunities to participate and compete in a whole range of sports and activities”. 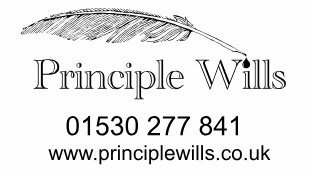 Principle Wills are available for a free consultation appointment to fully understand your requirements covering everything from a Standard Will to a full Estate Administration Service which can be arranged in the comfort of your home and at a time to suit you and designed to help you in ‘Getting Your Affairs In Order’. Principle Wills will donate a fixed fee for every client instruction received through their offices and clients are asked to quote code: SSP10. Leicester-Shire & Rutland Sport (LRS) is the local network and support team for sport, physical activity and wellbeing opportunities across the city and county; their focus is to ensure national resources have local reach. LRS work in partnership to inspire generations to start, stay and succeed in sport and physical activity. The NWLSSP works alongside LRS to deliver School Games objectives and wider programmes including the County Leadership Academy and Sport and Physical Activity Commissioning Plan. County Sports Partnerships (CSPs) like LRS have been set up by Sport England as the delivery system for the development of sport and physical activity at a county level, working across the sporting landscape, actively supporting partners to increase participation in sport and physical activity. The NWLSSP works with Leicestershire County Council through the Sport and Physical Activity Commissioning Plan to deliver interventions and education to young people in schools around the benefits of leading an active lifestyle. Leicestershire Nutrition and Dietetic Services (LNDS) deliver a range of services to Leicestershire county, Leicester city and Rutland. They work within the community, in outpatients, and in the community and city hospitals. The service provides support for people who have diverse nutritional needs, during the treatment of health conditions or in their prevention. Support is provided via one-to-one and group consultations, and can signpost people to other service providers. The LNDS also offer training to institutions and business, support students of all ages, and through the Public Health Team, work to engage the wider public with positive diet and lifestyle messages. The School Games is a unique opportunity to motivate and inspire millions of young people across the country to take part in more competitive school sport. The NWLSSP hosts the School Games Organiser role that drives this agenda forward locally. Sports Leaders UK awards and qualifications equip young people with employability skills for life improving motivation, self-esteem, communication, team work and confidence. Leadership volunteering is a vital part of all our courses allowing young people to practice and build their skills in order to ‘Give More. Become More.’ to improve employability. The NWLSSP delivers SLUK Level 1 and 2 awards in our secondary schools, as well as providing students with the opportunity to gain leadership experience supporting our events calendar. The Youth Sports Trust is a charity that believes every child has a right to be physically active through quality PE and school sport. There is an overwhelming amount of evidence that demonstrates how PE and school sport has the power to develop young people’s potential, helping them to be healthy and happy, succeed in life and contribute to society. As a member benefit to our schools the NWLSSP affiliates all schools to a Level 1 membership with the YST.